Here is a link to the source document for this prayer. MacNutt, Francis, PhD, “Deliverance from Evil Spirits”, 1995, Chosen Books, Grand Rapids, MI, 288 pages. MacNutt, Francis, PhD, “Healing”, 1974, 1999, Ave Maria Press, Notre Dame, IN, 268 pages. MacNutt, Francis, PhD, “The Power to Heal”, 1977, Ave Maria Press, Notre Dame, IN, 254 pages. Mansfield, Patti Gallagher, “As by a New Pentecost: The Dramatic Beginning of the Catholic Charismatic Renewal”, 1992, Franciscan University Press, 179 pages. McDonnell, Kilian and Montague, George T., “Christian Initiation and Baptism in the Holy Spirit: Evidence from the First Eight Centuries”, Second Revised Edition, 1994, The Liturgical Press, Collegeville MN, 396 pages. Fr. Dave Pivonka, TOR, “Breath of God — Living a Life led by the Holy Spirit”, 2015. “New American Bible, Revised Edition”, 2011, Confraternity of Christian Doctrine. “Catechism of the Catholic Church: Second Edition”, 1997, United States Catholic Conference, Washington D.C., 904 pages. 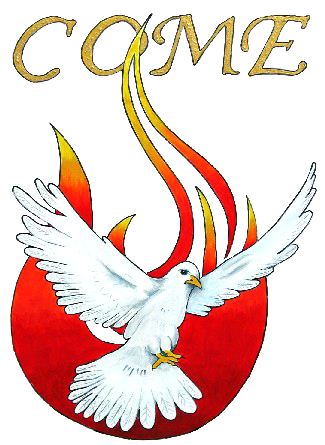 The Church, therefore, instructed by the words of Christ, and drawing on the experience of Pentecost and her own apostolic history, has proclaimed since the earliest centuries her faith in the Holy Spirit, as the giver of life, the one in whom the inscrutable Triune God communicates himself to human beings, constituting in them the source of eternal life. In a certain sense, my previous Encyclicals Redemptor Hominis and Dives in Misericordia took their origin and inspiration from this exhortation, celebrating as they do the event of our salvation accomplished in the Son, sent by the Father into the world “that the world might be saved through him”8 and “every tongue confess that Jesus Christ is Lord, to the glory of God the Father.”9 From this exhortation now comes the present Encyclical on the Holy Spirit, who proceeds from the Father and the Son; with the Father and the Son he is adored and glorified: a divine Person, he is at the center of the Christian faith and is the source and dynamic power of the Church’s renewal.10 The Encyclical has been drawn from the heart of the heritage of the Council. For the Conciliar texts, thanks to their teaching on the Church in herself and the Church in the world, move us to penetrate ever deeper into the Trinitarian mystery of God himself, through the Gospels, the Fathers and the liturgy: to the Father, through Christ, in the Holy Spirit. In this way the Church is also responding to certain deep desires which she believes she can discern in people’s hearts today: a fresh discovery of God in his transcendent reality as the infinite Spirit, just as Jesus presents him to the Samaritan woman; the need to adore him “in spirit and truth”11; the hope of finding in him the secret of love and the power of a “new creation”12: yes, precisely the giver of life. The Church feels herself called to this mission of proclaiming the Spirit, while together with the human family she approaches the end of the second Millennium after Christ. Against the background of a heaven and earth which will “pass away,” she knows well that “the words which will not pass away”13 acquire a particular eloquence. They are the words of Christ about the Holy Spirit, the inexhaustible source of the “water welling up to eternal life,”14 as truth and saving grace. Upon these words she wishes to reflect, to these words she wishes to call the attention of believers and of all people, as she prepares to celebrate- as will be said later on-the great Jubilee which will mark the passage from the second to the third Christian Millennium. Excerpt from Saint Pope John Paul II’s Encyclical. Please click on this link for the complete document. THE REDEEMER OF MAN, Jesus Christ, is the centre of the universe and of history. To him go my thoughts and my heart in this solemn moment of the world that the Church and the whole family of present-day humanity are now living. In fact, this time, in which God in his hidden design has entrusted to me, after my beloved Predecessor John Paul I, the universal service connected with the Chair of Saint Peter in Rome, is already very close to the year 2000. At this moment it is difficult to say what mark that year will leave on the face of human history or what it will bring to each people, nation, country and continent, in spite of the efforts already being made to foresee some events. For the Church, the People of God spread, although unevenly, to the most distant limits of the earth, it will be the year of a great Jubilee. We are already approaching that date, which, without prejudice to all the corrections imposed by chronological exactitude, will recall and reawaken in us in a special way our awareness of the key truth of faith which Saint John expressed at the beginning of his Gospel: “The Word became flesh and dwelt among us”1, and elsewhere: “God so loved the world that he gave his only Son, that whoever believes in him should not perish but have eternal life”2. It was to Christ the Redeemer that my feelings and my thoughts were directed on 16 October of last year, when, after the canonical election, I was asked: “Do you accept?” I then replied: “With obedience in faith to Christ, my Lord, and with trust in the Mother of Christ and of the Church, in spite of the great difficulties, I accept”. Today I wish to make that reply known publicly to all without exception, thus showing that there is a link between the first fundamental truth of the Incarnation, already mentioned, and the ministry that, with my acceptance of my election as Bishop of Rome and Successor of the Apostle Peter, has become my specific duty in his See. I chose the same names that were chosen by my beloved Predecessor John Paul I. Indeed, as soon as he announced to the Sacred College on 26 August 1978 that he wished to be called John Paul-such a double name being unprecedented in the history of the Papacy-I saw in it a clear presage of grace for the new pontificate. Since that pontificate lasted barely 33 days, it falls to me not only to continue it but in a certain sense to take it up again at the same starting point. This is confirmed by my choice of these two names. By following the example of my venerable Predecessor in choosing them, I wish like him to express my love for the unique inheritance left to the Church by Popes John XXIII and Paul VI and my personal readiness to develop that inheritance with God’s help. Through these two names and two pontificates I am linked with the whole tradition of the Apostolic See and with all my Predecessors in the expanse of the twentieth century and of the preceding centuries. I am connected, through one after another of the various ages back to the most remote, with the line of the mission and ministry that confers on Peter’s See an altogether special place in the Church. John XXIII and Paul VI are a stage to which I wish to refer directly as a threshold from which I intend to continue, in a certain sense together with John Paul I, into the future, letting myself be guided by unlimited trust in and obedience to the Spirit that Christ promised and sent to his Church. On the night before he suffered he said to his apostles: “It is to your advantage that I go away, for if I do not go away, the Counsellor will not come to you; but if I go, I will send him to you”5. “When the Counsellor comes, whom I shall send to you from the Father, even the Spirit of truth, who proceeds from the Father, he will bear witness to me; and you also are witnesses, because you have been with me from the beginning”6. “When the Spirit of truth comes, he will guide you into all the truth; for he will not speak on his own authority, but whatever he hears he will speak, and he will declare to you the things that are to come”7. Excerpt from the Encyclical by Saint Pope John Paul II. Please click on this link for the complete text of the Encyclical. 3. From the outset it should be noted that the society established by the Redeemer of the human race resembles its divine Founder, who was persecuted, calumniated and tortured by those very men whom He had undertaken to save. We do not deny, rather from a heart filled with gratitude to God We admit, that even in our turbulent times there are many who, though outside the fold of Jesus Christ, look to the Church as the only haven of salvation; but We are also aware that the Church of God not only is despised and hated maliciously by those who shut their eyes to the light of Christian wisdom and miserably return to the teachings, customs and practices of ancient paganism, but is ignored and neglected, and even at times looked upon as irksome by many Christians who are allured by specious error or caught in the meshes of the world’s corruption. In obedience, therefore, Venerable Brethren, to the voice of Our conscience and in compliance with the wishes of many, We will set forth before the eyes of all and extol the beauty, the praises, and the glory of Mother Church to whom, after God, we owe everything. 4. And it is to be hoped that Our instructions and exhortations will bring forth abundant fruit in the souls of the faithful in the present circumstances. For We know that if all the sorrows and calamities of these stormy times, by which countless multitudes are being sorely tried, are accepted from God’s hands with calm submission, they naturally lift souls above the passing things of earth those of heaven that abide forever, and arouse a certain secret thirst and intense desire for spiritual things. Thus, urged by the Holy Spirit, men are moved, and as it were, impelled to seek the kingdom of God with greater diligence; for the more they are detached from the vanities of this world and from inordinate love of temporal things, the more apt they will be to perceive the light of heavenly mysteries. But the vanity and emptiness of earthly things are more manifest today than perhaps at any other period, when Kingdoms and States are crumbling, when enormous quantities of goods and all kinds of wealth are being sunk in the depths of the sea, and cities, towns and fertile fields are strewn with massive ruins and defiled with the blood of brothers. 5. Moreover, We trust that Our exposition of the doctrine of the Mystical Body of Christ will be acceptable and useful to those also who are without the fold of the Church, not only because their good will toward the Church seems to grow from day to day, but also because, while before their eyes nation rises up against nation, kingdom against kingdom, and discord is sown everywhere together with the seeds of envy and hatred, if they turn their gaze to the Church, if they contemplate her divinely-given unity – by which all men of every race are united to Christ in the bond of brotherhood – they will be forced to admire this fellowship in charity, and with the guidance and assistance of divine grace will long to share in the same union and charity. Excerpt of the Encyclical from Pope Pius XII. Please click on this link for the complete text of the Encyclical. Peace and Communion with the Holy See. That divine office which Jesus Christ received from His Father for the welfare of mankind, and most perfectly fulfilled, had for its final object to put men in possession of the eternal life of glory, and proximately during the course of ages to secure to them the life of divine grace, which is destined eventually to blossom into the life of heaven. Wherefore, our Saviour never ceases to invite, with infinite affection, all men, of every race and tongue, into the bosom of His Church: “Come ye all to Me,” “I am the Life,” “I am the Good Shepherd.” Nevertheless, according to His inscrutable counsels, He did not will to entirely complete and finish this office Himself on earth, but as He had received it from the Father, so He transmitted it for its completion to the Holy Ghost. It is consoling to recall those assurances which Christ gave to the body of His disciples a little before He left the earth: “It is expedient to you that I go: for if I go not, the Paraclete will not come to you: but if I go, I will send Him to you” (1 John xvi., 7). In these words He gave as the chief reason of His departure and His return to the Father, the advantage which would most certainly accrue to His followers from the coming of the Holy Ghost, and, at the same time, He made it clear that the Holy Ghost is equally sent by-and therefore proceeds from-Himself and the Father; that He would complete, in His office of Intercessor, Consoler, and Teacher, the work which Christ Himself had begun in His mortal life. For, in the redemption of the world, the completion of the work was by Divine Providence reserved to the manifold power of that Spirit, who, in the creation, “adorned the heavens” (Job xxvi., 13), and “filled the whole world” (Wisdom i., 7). 2. Now We have earnestly striven, by the help of His grace, to follow theexample of Christ, Our Saviour, the Prince of Pastors, and the Bishop of ourSouls, by diligently carrying on His office, entrusted by Him to the Apostles and chiefly to Peter, “whose dignity faileth not, even in his unworthy successor” (St. Leo the Great, Sermon ii., On the Anniversary of his Election). In pursuance of this object We have endeavoured to direct all that Wehave attempted and persistently carried out during a long pontificatetowards two chief ends: in the first place, towards the restoration, both in rulers and peoples, of the principles of the Christian life in civil and domestic society, since there is no true life for men except from Christ; and, secondly, to promote the reunion of those who have fallen away from the Catholic Church either by heresy or by schism, since it is most undoubtedly the will of Christ that all should be united in one flock under one Shepherd. But now that We are looking forward to the approach of the closing days of Our life, Our soul is deeply moved to dedicate to the Holy Ghost, who is the life-giving Love, all the work We have done during Our pontificate, that He may bring it to maturity and fruitfulness. In order the better and more fully to carry out this Our intention, We have resolved to address you at the approaching sacred season of Pentecost concerning the indwelling and miraculous power of the Holy Ghost; and the extent and efficiency of His action, both in the whole body of the Church and in the individual souls of its members, through the glorious abundance of His divine graces. We earnestly desire that, as a result, faith may be aroused in your minds concerning the mystery of the adorable Trinity, and especially that piety may increase and be inflamed towards the Holy Ghost, to whom especially all of us owe the grace of following the paths of truth and virtue; for, as St. Basil said, “Who denieth that the dispensations concerning man, which have been made by the great God and our Saviour, Jesus Christ, according to the goodness of God, have been fulfilled through the grace of the Spirit?” (Of the Holy Ghost, c. xvi., v. 39). Excerpt from the Encyclical by Pope Leo XIII. Please click on this link for the complete document. The Archdiocese of Portland celebrated the 50th Anniversary for the Catholic Charismatic Renewal in Salem, OR on August 18-19, 2017. Archbishop Sample: He is the 11thArchbishop of the Archdiocese of Portland, OR. He was ordained as a Priest on June 1, 1990, and ordained Bishop of Marquette, MI on January 25, 2006. He was installed as Archbishop of Portland on April 2, 2013. His homily during the Jubilee Mass: “The History of the Catholic Charismatic Renewal”. James Murphy: He is the founder and president of Vera Cruz Communications. He has worked in the Catholic Church in many capacities including: youth ministry at the parish, diocesan, national and international levels. He gives parish missions, speaks at retreats, and consults for many parish and diocesan level groups in the Church. In addition to his work with Vera Cruz Communications, Jim is the former chairman of, and currently a consultant to The National Service Committee for the Catholic Charismatic Renewal. He is a former producer of “The Choices We Face”, a weekly television program of Renewal Ministries. He is past Chairman of the Youth Executive Committee for the North American Renewal Service Committee, an ecumenical organization. Jim was recently elected President of the International Catholic Charismatic Renewal Service (ICCRS), whose offices are located at the Vatican, in Rome. Jim Murphy made a second talk at this Jubilee celebration. Fr. Theodore Lang. He is a priest for the Archdiocese of Portland in Oregon. On February 10, 2016 he was commissioned by Pope Francis as a Missionary of Mercy for the Jubilee of Divine Mercy. Fr. Theo has preached numerous retreats, days of reflections, written articles for the Catholic Sentinel and speaks at conferences in addition to serving at many parishes on weekends as a Missionary of Mercy or promoting the Knights of Columbus. He is spiritually associated with the Family of the Pierced Hearts, whose foundress is Mother Adela Galindo, SCTJM. Fr. Lange has served at Mt. Angel Seminary as a formation director and a professor of spirituality and theology. Fr. Theo was transferred to St. Catherine of Siena in Veneta, OR on July 1, 2017. He also serves as the State Chaplain for the Knights of Columbus. Talk: “His testimony and how he sees the future of the Renewal”. Fr. 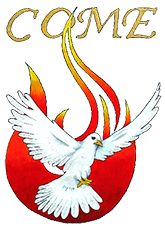 Dave Pivonka, TOR, a Franciscan priest, has developed a series of fourteen videos on the actions of the Holy Spirit. — The first video is a brief explanation for the use of the words “Wild Goose” for the Holy Spirit. — You can learn more about Fr. Dave at this link. — Fr. Dave invites each of us to join him on a journey led by the Holy Spirit in this introduction video trailer. — The link to a brief explanation of the 14 individual segments in this series. At the bottom of this page is a link to the individual video segments. — When you select a specific segment in the series you have an opportunity to download a study guide for that segment. One of the retreat participants at the February 1967 “Duquesne weekend” at the Ark and the Dove retreat house, was Patti Mansfield. She was the first Catholics to experience being “baptized in the spirit”, during that retreat. She was in at the beginning of the Catholic Charismatic Renewal in the Church. Here is a link to her video testimony. Before he was ordained as an Auxiliary Bishop in the Archdiocese of Portland, Fr. Peter Smith was the Archbishop’s Liaison for the Portland Archdiocese, to the Catholic Charismatic Renewal. During that time, he wrote a series of newsletters that provided a valuable insight into the Charismatic Renewal in this Archdiocese. Note: All of these Newsletter’s are in Adobe “pdf” format. Here are the “New Life in the Spirit” newsletters for this Liturgical Year.